Synopsis: Quiet, gruff Cody takes solace in his new job- the night guard of an eccentric hobbyist’s mannequin village. But he can only live in this fantasy for so long before reality catches up to him. Cody – Lead Role – Look 25-30. A plus sized male with a boyish face who is still living with his smothering mother. Man of few words, distant, given up, visible sadness. Raelynn – Supporting Role – Look 50-60. A well-meaning, but somewhat smothering mother to Cody. She is at her wits end. Ed – Supporting Role – Look 50-80. An eccentric and recluse old man who owns a mannequin village. Speaks with a clipped cadence and can’t seem to maintain eye contact. 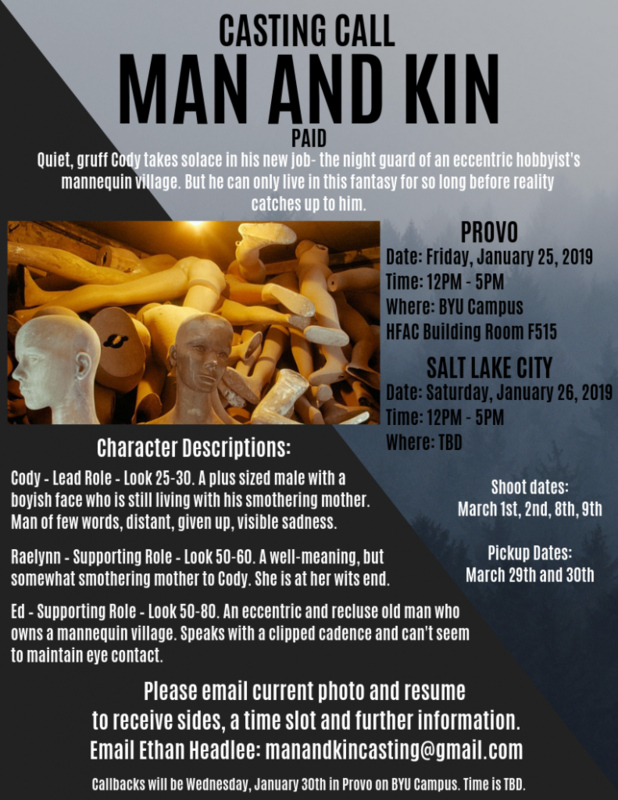 Email manandkincasting@gmail.com with current photo and resume to receive sides and further information.